With a new cosmetic line popping up seemingly every day, combing through the slew of products to find the best of the crop can be a daunting task. More and more now, celebrities are creating lines, existing companies are expanding and entrepreneurs are building beauty lines from the ground up. What’s really exciting to us, though, is when a makeup artist creates a line of cosmetics. No one works with makeup more than professional artists, and no one hears the needs of women more than a makeup artist hearing a client’s concerns. The latest foray into the world of cosmetics comes from Troy Surratt, a celebrity makeup artist whose client list includes Adele and Charlize Theron. Besides just listening to what women really want and understanding what makes good makeup, Troy is most dedicated to innovation and quality in his products, so that women can use exactly what it is that makes them feel beautiful in their own skin, not putting emphasis on what the world defines as beauty. 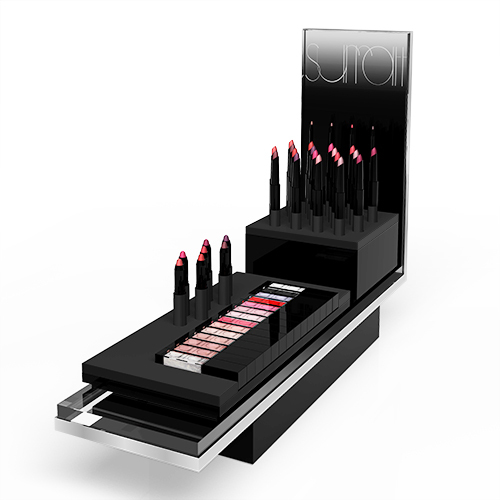 Now available at Barney’s New York, Troy’s collection, named Surratt, includes Lip Lustre ($32), Brow Pomade ($25), Skin Concealer ($50), the Smokey Eye Baton ($35) and more. We caught up with Troy at Barney’s to learn why his products are different, how the products are manufactured and which products will be the “heroes” of the line. Read on below! Beauty High: What did you feel like other lines were missing that you really wanted to put into your own makeup line? Troy Surratt: Innovation and quality, and I think that there have been so many examples of “me too” in the marketplace where they’re like, “They’re doing really well with cheek stain! We have to do a cheek stain too!” So I wanted to create products that were innovative that felt modern. The two questions I asked myself throughout the development of my brand were, is it cool? Is it modern? And exactly what that means in beauty right now. I also wanted an element of customization. I don’t like rules. I feel like the consumer has been presented with color palettes that marketing teams have come up with for her, and I think that now the consumer is smarter and savvier about beauty than ever, and she’s capable of making her own choices. So we created a system that allows her to create customized compacts, either on her own or with the help of a consultant. Also just a level of quality. I think that I walk through beauty stores and sometimes I’m surprised at where things are made, like where things we’re putting on our faces are made. So in traveling the world and visiting labs everywhere, I was most impressed with the Japanese labs, and I decided to produce everything in Japan where the labs are so sterile and beautiful and state of the art. Besides the customizable palette, what are the one or two products you’re really excited about in your line? When people ask me what the “hero” products will be, I say that I’ve tried to create a line of all hero products. Being a makeup artist, I’m a cherry picker, and I’ve always adopted the cult products or the favorites from every line. Anything that was buzz-worthy I would try and adopt for myself, so I tried to create an entire line of heroes. A couple of the standouts are, I created a Smokey Eye Baton. One of the questions I’m most asked by women is how to do a smokey eye. For my entire career, I’ve been asked over and over how to do a smokey eye. I created a Smokey Eye Baton that’s a double ended product. One end is a creamy eyeliner that can be used to line the wet line and the perimeter of the lashes, and the other end has a eyeshadow that’s spring loaded with a smudger, so you can diffuse and smudge out that line and create that gorgeous sort of ombre, diffused smokiness quickly and easily. I also created a Brow Pomade that was inspired by my own unruly brows. I was grooming my own brows with mustache wax, and I thought, “there has to be a better way to do this!” And I thought could I create a product that was a water soluble wax that could be used to style the brows? So we set forth creating that with a Japanese lab, and when I show that to people they’re very excited about it. All of the powder products are a slurry technology, which means they were a liquid before they were a powder. So, they’re actually poured then gently pressed. Traditionally, powder products are made with pressure and force and they’re compacted into aluminum pans. We’ve eliminated the aluminum pan, so it looks to me sleeker and sexier and more modern, and it results in a more blendable, velvety, moist texture which you’ll feel.